T-Bone Racing front bumper giveaway! Savage Front Bumper from T-Bone Racing. 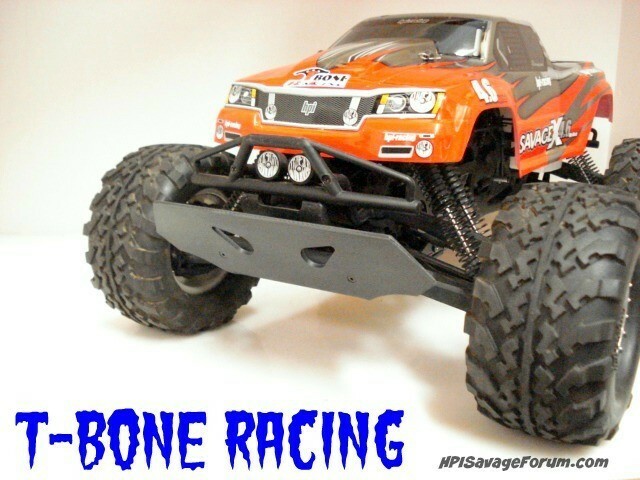 If you've already used a T-Bone Racing then you already know how well these things work and protect your RC - if not you're in for a pleasant surprise. Simply post a reply to this thread, LIMIT ONE POST PER DAY. ** You must have at least 30 posts or more to enter! ** OR be a HPISF Supporting Member! BE SURE TO SHARE ON FACEBOOK! ONE Winner will be randomly picked on June 29th @ 1:00PM EST. Good luck! That bumper give real "umph" to savage...Even though when i saw t-bone first thing i imagined was a steak.. This is a must on my savage, driven not only by me, but especially when driven by my two five-year-olds. They love smashing a tree or alike. Hubba hubba thanks for contest ! Sure I'm in, but I never win. Thanks for another great giveaway Woodie! Awesome, never heard of t-bone (other than the steak..lol) count me in. ooo ive heard that they are good bumpers....I'm in! thx for the giveaway! Sounds good to me! Thanks Woodie. Do they make one for the savage 25? Alot of the parts are interchanageable through the different models of savages. I cant say for sure if these are or not you could look up the part number for the 25 bumper and compare it to the part number of the X and Flux if they are the same then all is good. Yes sir...another entry in the books.